Learn more about your window and door options, visually. Learn about our fast and easy process. Posted on May 22, 2017. If you are looking for ways to spruce up your house, look no further than the front door. Excellent entrance doors are a great choice for home improvement. They give visitors their first impression of your home and of you. Portland doors and windows can do more than offer security and keep out weather and sound. The right exterior front doors in Portland, OR, can give your home real personality. Striking entry doors can be a reflection of who you are. They can show aspects of your individual personality to all visitors. When you go to an experienced, reputable door installation company, you can choose from a wide variety of styles, materials and colors. Select classic paneled designs showing natural wood grain for a traditional look, or let your imagination run wild with tasteful, creative metalwork and unusual designs paired with color. Your door can express who you are before you even answer it. Naturally, when you shop for exterior front doors in Portland, OR, security is a major consideration. High-quality entrance doors can combine great looks with security features to give you the best of both worlds. You want to look for doors made of strong materials, and that are without weak points so they can provide maximum structural integrity over time. When you want security, you do not have to sacrifice appearance. Portland doors and windows can protect your family and look good at the same time. Attractive entry doors are solid investments because they will wear well over time, giving you and your family years of trouble-free use, beauty and security. However, should you ever decide to sell your house, your investment can offer big returns. An attention-grabbing front door offers real curb appeal as well as adding genuine value to your home. Quality Portland doors and windows are great investments because they improve your home and your life. 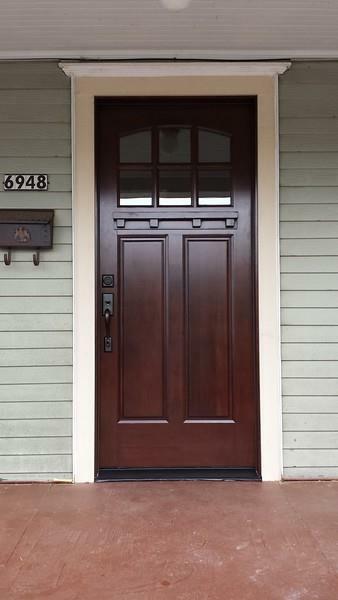 Great exterior front doors in Portland, OR, offer strong security and a return on your initial expenditure. In addition, they can give your home style that reflects your own personality. © 2019 Accurate Window & Door. Developed and Designed by Monopolize Your Marketplace.